Sen. Dana Young advocates for a ban on greyhound racing at the campain launch for Protect Dogs - Yes on 13. 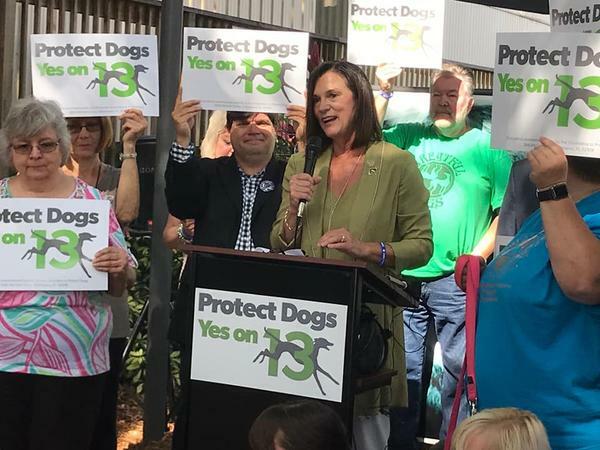 Supporters of an amendment to ban greyhound racing in Florida launched their campaign Monday at the Humane Society of Tampa Bay, with several grassroots speakers and Republican Senator Dana Young. Protect Dogs – Yes on 13 is an online campaign that is working to inform voters about what they call the cruelties of dog racing. The group is sponsored by Grey2K USA and the Humane Society of the United States. Sen. Young has been advocating for greyhounds since she was a Florida Representative. Young filed a bill in 2011 trying to remove the required minimum number of live performances for a greyhound permit holder. After the press conference, the campaign premiered a video explaining their cause. Amendment 13 is on the ballot this November.